The Mutant Epoch:: The Outland Arts Insider Newsletter. Welcome to the Outland Arts Insider portion of the website. Sine our company is primarily focused on The Mutant Epoch, we decided to post these newsletters in the Mutant Epoch section of the Outland Arts site, although may duplicate this content in another area as we release new product lines. The first newsletter came out in October 2010 and was too optimistic in the release date of the TME Hub Rules book, however we thought we would post that earlier newsletter here just for archival purposes. We also first thought we would put out an issue of this newsletter bi-monthly, but now plan to put it out once a month, at a minimum, and more often when we have notable content or something post-apocalyptic to share. If you've not already signed up for the mailing list, you can do so here. Where have the summer and fall gone? Has it really been April since we posted our last newsletter? Well, first off, apologies to all of you who have recently signed up to this newsletter and were waiting for an issue. Secondly, sorry to those of you on the forum who have yet to receive responses from me. As many of you know, I have up until recently been immersed ­– no crushed – by the workload involved in getting the hefty Crossroads Region Gazetteer completed. I think when you see it you’ll understand why the tome has taken extra long and demanded extra attention. I never thought it would be so comprehensive, intertwined, and lengthy at 448 pages. Well, I am happy to report that it is finally done and off to press. The official release date is not yet set, pending delivery at the distributor, but… for members of this newsletter list, the forum, blog, and twitter followers, we are announcing a pre-sales deal. Of course, if you can wait to get the book at your local friendly gaming store, please do, but if you can’t, read on…. The Crossroads Region Gazetteer Pre-Sales Deal is this. Using Paypal (send payment to info@outlandarts.com) you can buy the 448 page softcover book at the regular price of $36.99 US and we’ll pay the shipping on it, plus, send you a FREE PDF copy the day of the release. Your print book will also be unleashed ­(printed and shipped) the day of the release and arrive a week or two later without you having to do anything. Of course, we will need your full mailing address and the email to which you want your PDF version to be directed. That’s it. Also, all you Brits, Europeans, Aussies and Canucks, same offer to you. The deal ends on the release date. Hardcover versions will be out in a month or two and available at drivethrurpg.com and go for $46.99. Those of you who have been on this list for a long time will already be aware of our upcoming releases. Immediately after The Crossroads Region is out, we will be diving headlong into finishing the art and final edits for The Mutant Bestiary One book, which is already well along towards publication. After that, we will tackle Plantoids . The planet character book is highly anticipated and will allow players to create veggie PCs and game masters to randomly generate monstrous plants as either unique abominations or whole new species to terrify their players. As a game master, I simply love unleashing a new monster into a game and watching the players squirm as they deal with the new horror. I think creating creatures is one of the main contributing reasons why I got into this hobby, or even started to draw. Given this, Mutant Bestiary One is a book I have been dying to get back to for years now, and can hardly wait to share it with the Mutant Epoch community. 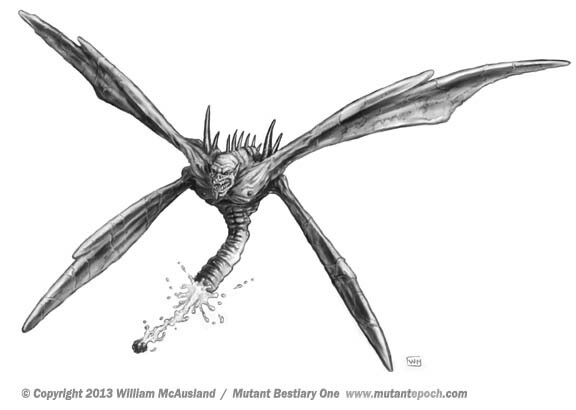 Here is just one of the creatures you’re gonna meet in this upcoming 148 page book…. Official video for PostHuman - produced by Colliculi Productions. 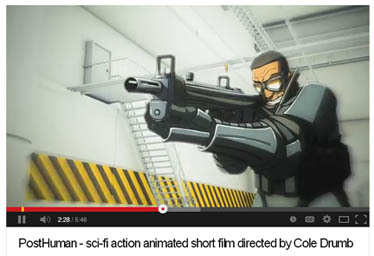 Animated sci-fi thriller short film featuring the voice of Tricia Helfer (Battlestar Galactica). Directed by Cole Drumb. Produced by Jennifer Wai-Yin Luk. Okay, so, holy crow, I look forward to seeing a lot more of this. Cool tech, cool weapons, and in particular, wicked mind powers. So I know the movie Oblivion came out in April 2013 but I don’t often get the chance to catch films in the theatre. In fact, I prefer to buy the DVDs for my collection and so wait a bit until l I can snap them up at some retail outlet. Recently I stumbled upon Oblivion and watched it with my family. As a bit of a departure on my usual plain old links, I’d like to share my thoughts on it without giving away too many spoilers. This is not a standard review but rather a look into the film’s post-apocalyptic elements from the viewpoint of a Game Master of The Mutant Epoch RPG. To start with, I enjoyed the entire film, including the storyline and characters, but the setting and visuals were the real thrill for me. I love this genre, and am fascinated with the whole post-apocalypse thing. Don’t get me wrong, I’d never want to live in the world of Oblivion, nor the Mutant Epoch for that matter... at least not with my current skill set, relics, and modest state of fitness. For those of you who haven't seen Oblivion yet, I don’t think I will ruin the movie for you if I describe some of the opening scenes, scenes anybody who has viewed the preview will have already been exposed to. 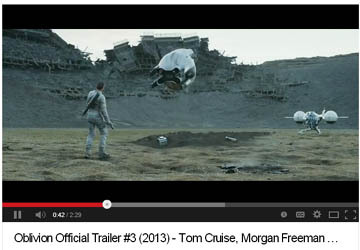 Tom Cruise’s character, Jack, is some sort of high tech mechanical-robotics technician. He flies an advanced relic craft and seems to visit the arid wasteland that was the eastern United States. Ruins protrude from the dunes and rubble, entire cargo ships jut from the sand like prehistoric skeletons, and mysterious, black clad nomads observe Jack’s activates with keen interest. The movie checks many of my PA entertainment boxes, including underground ruins, scrap built gear, raider-militia types, robotics, action, peril, radiation, inhuman intelligences, and discovery of the collapse of the oldsters. There is more I’d love to share here, but I’d rather coax you to see the film for yourself than reveal it all here. The cast, which included Tom Cruise, Andrea Riseborough, Olga Kurylenko, Morgan Freeman plus Melissa Leo, all performed flawlessly in their roles, and if you’re A Game of Thrones HBO series fan, there is another actor in this film you’ll be happy to see, Nikolaj Coster-Waldau, even though his role was sadly limited. For anybody interested in the PA genre, and if you’re on this mailing list you are probably a fan, then, this movie will visually inspire you. I promise. Finally, there is the sound track by M86 featuring Susanne Sundfør. Which I seem to see at Grooveshark. The links don’t seem to work when I post them in this newsletter, but just type in 'Oblivion' in the search window at http://www.grooveshark.com and you’ll be listening to the soundtrack in no time. In closing, I don’t normally rave about a film in this short newsletter, but felt that Oblivion deserved it. Four and half stars out of five! So let me tell you about a great guy called Toren Atkinson, another artist-writer who along with Warren Banks wrote Space Ship Zero published by Green Ronin. 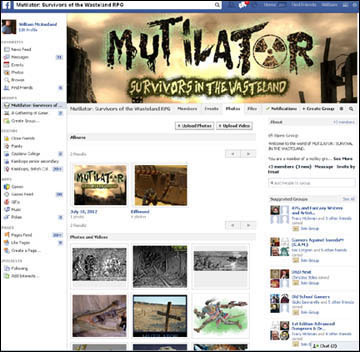 Anyhow, Toren has been working on a tabletop rpg using the Mutilator animated short as inspiration. Along with a very active and resource rich Facebook page, he has made a ton of excellent gaming content available to all. I recommend you checking it out, saying hello, and perhaps contributing to this excellent community. 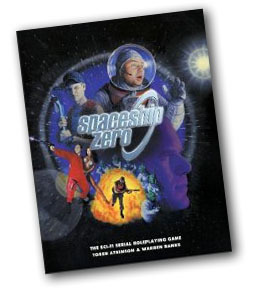 As I have been so busy with the Crossroads book, I haven’t had a chance to give Spaceship Zero a meaningful perusal or roll up a character, but when I do, I’ll tell you about it here. From what I have seen of the book, though, there are a lot of fun and useful creatures, gizmos and game ideas of value to any Mutant Epochian. Well, that’s it this time around. 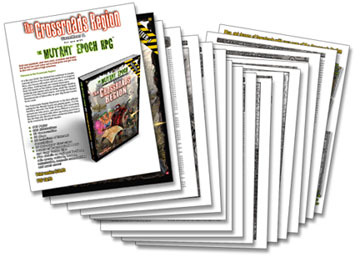 We will send another newsletter out as soon as The Crossroad Gazetteer Book is officially released! About this email: Our records indicate that you would like to receive this newsletter. If you would no longer like to receive Outland Arts Insider, please email us with the word unsubscribe in the subject line or body text.